Yep, so I'm trying Twitter again and this time I stuck with it a bit longer. I still think it's a time sucker, gradually seeping into time that could be better spent elsewhere, but I'm good at multitasking and moderating my time well, so there's no way of me becoming an addict that tweets every single detail of his/her life. Instead, I've been using it to meet some really great people and have discovered sites, links, and stories that I wouldn't have otherwise seen at all. The downside is that it gives me even more than I want to blog about and I'm already well behind in my to-do list (read: folder after folder after folder of bookmarked links) of things to write about here. Oh well. So moving on, yesterday I was reading what people were talking about, and ran across a man confessing that he always sneezes the first time he bites into chocolate. Wait, what? I know people who sneeze after eating mints or looking directly into lights, but mints? Here's a few of the other fun quirks. Feel free to let me know what yours are, too! The best part of that one is that she actually went and took a picture of it! Twitter -- I'm so sporadic, and I feel it's pointless since I don't think anyone reads mine. I keep Visine next between my keyboard and monitor, in case I get hit with a sudden attack of dry eyes. 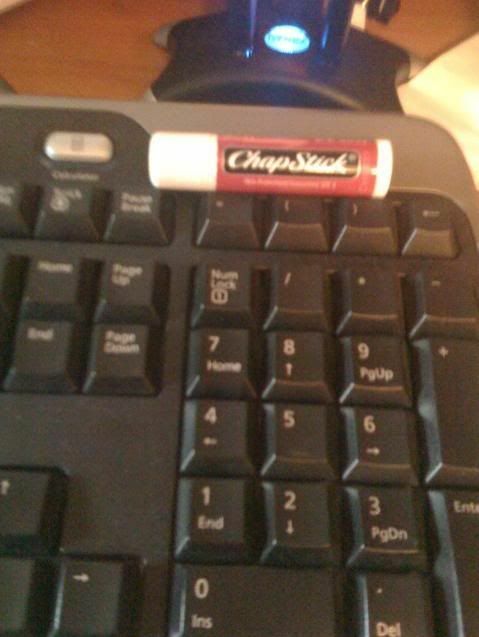 I have no idea why I was positive the person who keeps Chapstick on the keyboard was a dude. I was really shocked to read "she." I guess to me Chapstick is a masculine item. Don't know why that is. I cannot bring myself to bite fully into an Oreo cookie (or the cheap store brand look alikes.) I must always break the two apart and then scrape each side to evenly distribute the white filling on each cookie. Then I bite into each one as a normal. That's not quirky, is it? You see Chapstick as masculine? Now 'that' I see as quirky, lol. I would have been shocked had it been a man who kept Chapstick around like that! But yes, on the Oreo note, I find that quite quirky, too, hehe.